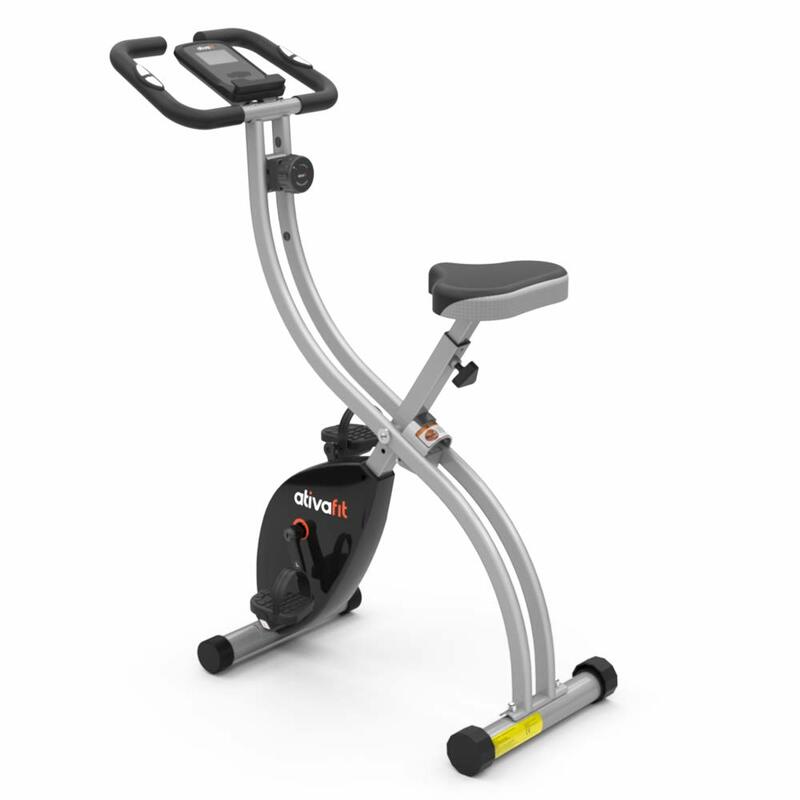 Grey AtivaFit Stationary Indoor Bike has a foldable design and magnetic resistance and can be used in upright and recumbent modes. It scores an average of 4.5 out of 5 stars by 18 customers. 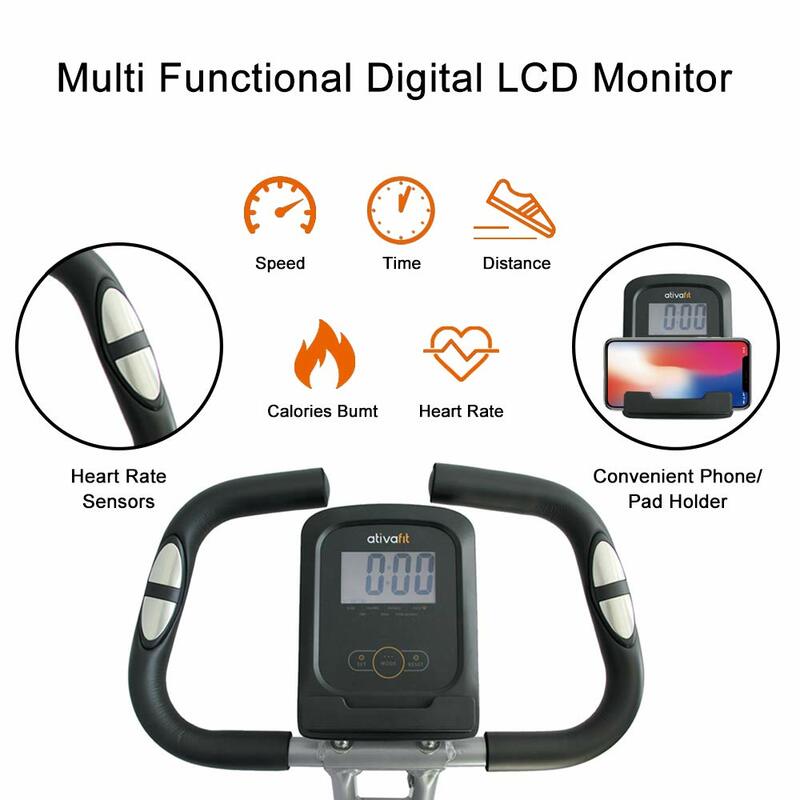 It has a small smart digital display monitor with the regular data of time, speed, calories, distance and heart rate via the handle sensors. And you will be able to see how you’re doing and your progress. There is a smartphone holder attached to the display panel if you wish to watch videos, listen to music or check your messages from your phone or small tablet while you’re working out. The comfortable seat with the connector screw design can be adjusted up and down (and distance to the panel) between 26 and 32 inches to accommodate different heights and has a maximum user weight capacity of 265 pounds. It feels quite sturdy and stable with an X-type steel frame that uses physical balance theory. And you should not worry about the bike shaking or wobbling or you falling down. Grey AtivaFit Bike weighs 34.2 pounds and measures 26.2 x 15.8 x 45.7 inches as assembled and 6.7 x 15.8 x 53.5 inches as folded. It is already compact in size and has a space saving foldable design and can be rolled easily on its transport wheels. And there won’t be any heavy lifting, or burden on your muscles or body. It has a small footprint and folds up small enough to fit into your closet. It runs very quietly thanks to the magnetic control flywheel and you can comfortably watch videos or listen to songs during your session. You can adjust the exercise intensity to eight levels via the tension knob depending on what you can handle. The anti-slip pedals have the straps to keep your feet in place and safe during your exercise. If you like working out at home and not have a lot of space, you can fold it and get it out of the way once you’re done with your daily workout till next time. It offers very good value for money: Easy to put together, versatile upright and recumbent use, functional and versatile, smooth and quiet operation, sturdy construction, large and comfy seat, adjustable resistance and adequate challenge, compact and space saving design, and very affordable price. It is shipped quickly via Amazon.com in solid packaging. People that own the product and that dealt with the customer service say that they are quite friendly and helpful. Please note that you need two get AA batteries for the LCD display as they’re not included in the package.